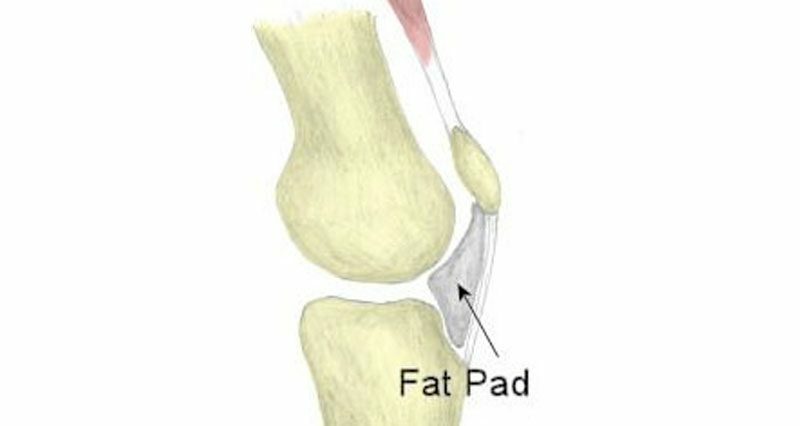 The infrapatellar fat pad is also sometimes known as Hoffa’s pad. It is a soft tissue that lies beneath the kneecap which can get impinged, causing knee pain. This knee injury can be caused by a severe impact which traps the pad between the patella and femoral condyle. Fat pad impingement symptoms include tenderness around the bottom and under the kneecap. Patients may have a history of being able to over straighten the knee, called knee hyperextension or genu recurvatum. In some cases, the bottom of the kneecap may be tilted outwards due to swelling underneath. A therapist or trainer will perform Hoffa’s test to help diagnose the injury. With the patient in lying with their knee bent, the examiner presses both thumbs along either side of the patellar tendon, just below the patella. 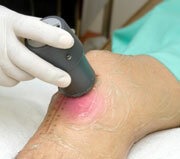 The patient is then asked to straighten their leg. Pain and/or apprehension of the patient is considered a positive sign for fat pad impingement). What is a fat pad impingement? The infrapatellar fat pad (sometimes known as Hoffa’s pad) is a soft tissue that lies beneath the patella (kneecap) separating it from the femoral condyle (end of the thigh bone). In situations where forces are directed at the patella, it acts as a shock absorber, thus protecting the underlying structures. Treatment of this condition is normally by conservative methods as opposed to through surgery. Rest and avoiding aggravating activities. Apply Ice or cold therapy to reduce pain and inflammation. Ice can be applied for 10 minutes every hour initially reducing as symptoms improve. Do not apply ice or cold packs directly to the skin as it may cause ice burns but wrap in a wet tea towel. A professional practitioner may use electrotherapy such as ultrasound and TENS. Muscle strengthening exercises to maintain the strength and fitness of the surrounding muscle groups should be done as pain allows. Taping the patella is known to be highly effective in fat pad impingement. One method involves taping the upper surface of the patella to allow more space for the structures beneath the lower surfaces i.e. the fat pad, and so putting them under less stress. If conservative treatment does not work then surgery may be advised. This may involve the complete or partial removal of the fat pad itself.